The biceps brachii is the most powerful supinator of the forearm; along with the brachialis, it provides elbow flexion. Bicipital tendon injuries of the elbow most commonly occur in the dominant extremity of active men aged 40-60 years, sometimes leading to significant impairment of daily activities. Injuries range from tendinitis to partial tears to complete ruptures. [1, 2] A rupture usually occurs at the insertion of the tendon to the radial tuberosity, resulting in pain and deformity about the elbow, as well as weakness, especially with supination. Most surgeons agree that the best results are obtained with early surgical intervention and reattachment of the tendon to the radial tuberosity. [3, 4, 5, 6, 7, 8, 9, 10] Without early surgical repair, chronic weakness and deformity persist. Pain typically resolves in time. Boyd and Anderson first described a modified two-incision approach for repair of a distal biceps tendon in 1961. The original approach involved subperiosteal dissection on the ulna. This led to an increased incidence of synostosis and heterotopic bone formation. A modified approach with muscle splitting rather than subperiosteal dissection decreases the incidence of synostosis and heterotopic bone formation. The biceps tendon is secured after the tuberosity is excavated. The tendon is fixed through three drill holes in the tuberosity. The advent of suture anchors has increased the popularity of the one-incision approach. This approach has the theoretical advantage of a low risk of synostosis. The originally described anterior one-incision extensile approach was associated with radial nerve injury. Today's limited anterior approach has been associated with neurapraxic injuries only. The lacertus fibrosus, an aponeurotic expansion, originates at the musculotendinous junction medially, blends distally with the fascia of the superficial flexor mass, and inserts on the proximal ulna. The lateral antebrachial cutaneous nerve travels between the brachialis and the biceps brachii and exits the arm in the subcutaneous tissue laterally. It supplies sensation to the lateral aspect of the forearm. The median nerve courses with the brachial artery and vein medial to the biceps tendon in the antecubital fossa. The artery bifurcates into the radial and ulnar arteries at the level of the radial head. A recurrent branch from the radial artery travels lateral and proximal across the antecubital fossa. The radial nerve travels laterally between the brachialis and the brachioradialis to enter the antecubital fossa. The superficial branch travels deep to the brachioradialis in the forearm. The deep branch enters the supinator muscle lateral to the radius and becomes the posterior interosseous nerve. Bicipital tendon injuries most commonly occur when an extension force is applied with the elbow in flexed position. This force overpowers the tendon and causes its rupture. It is believed that a degenerative process occurs in the tendon prior to the rupture. This process is evident clinically at the time of surgery with the finding of a bulbous, degenerated end of the tendon. Histologic studies have confirmed the degenerative process. Exactly how partial ruptures are related to this process is unknown. In addition, mechanical and vascular issues contribute. The overall frequency of bicipital tendon injuries is not truly known, but such injuries have been reported to occur in 1.2 patients per 100,000 population. Distal biceps tendon rupture has been reported with increasing frequency, but generally is considered to represent only 3% of biceps tendon injuries as a whole. This injury is more common in men and rarely reported in women. Schneider et al performed a retrospective study of 10 patients who sustained nonsimultaneous bilateral distal biceps brachii tendon ruptures that were repaired surgically. They found that bilateral distal biceps tendon ruptures tended to occur in middle-aged men who commonly participated in weightlifting, manual labor, or sports and who had higher rates of nicotine use (50%) and anabolic steroid use (20%) than the general population. The mean time from the first tendon rupture to the contralateral tendon rupture was 2.7 years (range, 0.5-6.3 years). Excellent results can be obtained with early surgical intervention. Early direct repair of the tendon to the radial tuberosity gives the best opportunity for full functional recovery. Operative treatment restores supination strength better than nonoperative treatment after distal biceps tendon rupture. Both the two-incision technique and the one-incision technique have yielded excellent results. [14, 15] The choice of technique depends on the surgeon's preference. Biomechanically, the cortical button has been shown to have the highest tensile load to failure. Clinically, however, good outcomes have been reported with the use of all types of fixation. [17, 18, 19] There is no consensus that one type of fixation is better than another. Freeman et al retrospectively compared the outcome of 18 patients with 20 distal biceps tendon ruptures managed nonoperatively with historical controls from six published series of operatively treated patients. The median supination and elbow flexion strengths for the injured arm in the nonoperative group were 63% and 93% of those for the contralateral arm, compared with values of 92% and 95% for the historical controls that had been treated surgically. Patients in this study had satisfactory outcomes overall, with median scores on the Broberg and Morrey Functional Rating Index, the Mayo Elbow Performance Index, and the Disabilities of the Arm, Shoulder and Hand questionnaire of 85, 95, and 9, respectively. The authors concluded that nonoperative treatment of distal biceps tendon ruptures may yield acceptable outcomes with modestly reduced strength, especially supination. Nesterenko et al measured isokinetic strength and endurance in elbow flexion and forearm supination in both arms of nine patients with an untreated unilateral complete distal biceps tendon rupture; one additional patient underwent isokinetic testing only. Peak torque was found to be significantly lower in involved limbs regarding both flexion and supination, but no significant differences were found in the fatigue index between involved and uninvolved limbs for flexion or supination. The authors noted that although nonoperative treatment is rarely recommended for complete distal biceps tendon ruptures, when it is selected, rehabilitation should concentrate on improving strength, not endurance. Cil et al studied an immediate active range-of-motion (ROM) protocol after modified two-incision distal biceps tendon repair in 21 patients with acute ruptures. After repair, the arms were placed in a sling for 1-2 days, followed by immediate active range of motion. For the first 6 weeks, the elbow was allowed activities of daily living, with a 1-lb weightlifting restriction. Mean follow-up extension was 0º, and mean follow-up flexion was 141º on the operated arm, with supination of 74º and pronation of 75º. Mean DASH score was 3.6±3.6; mean follow-up isometric flexion strength was 5%; and the power (dynamic strength) of flexion was 12% greater on the operated side. However, on the operated arm, follow-up isometric supination strength was 9% less and the power of supination was 11% less. According to the authors, the modified two-incision distal biceps repair allows a safe immediate active ROM protocol with early return of nearly full ROM and strength. Haverstock J, Athwal GS, Grewal R. Distal Biceps Injuries. Hand Clin. 2015 Nov. 31 (4):631-40. [Medline]. Hsu D, Chang KV. Biceps Tendon Rupture, Upper Limb. Treasure Island, FL: StatPearls; 2018. [Full Text]. Mazzocca AD, Spang JT, Arciero RA. Distal biceps rupture. Orthop Clin North Am. 2008 Apr. 39 (2):237-49, vii. [Medline]. Hamer MJ, Caputo AE. Operative treatment of chronic distal biceps tendon ruptures. Sports Med Arthrosc Rev. 2008 Sep. 16 (3):143-7. [Medline]. Chavan PR, Duquin TR, Bisson LJ. Repair of the ruptured distal biceps tendon: a systematic review. Am J Sports Med. 2008 Aug. 36 (8):1618-24. [Medline]. D'Arco P, Sitler M, Kelly J, Moyer R, Marchetto P, Kimura I, et al. Clinical, functional, and radiographic assessments of the conventional and modified Boyd-Anderson surgical procedures for repair of distal biceps tendon ruptures. Am J Sports Med. 1998 Mar-Apr. 26 (2):254-61. [Medline]. Churgay CA. Diagnosis and treatment of biceps tendinitis and tendinosis. Am Fam Physician. 2009 Sep 1. 80 (5):470-6. [Medline]. D'Alessandro DF, Shields CL Jr, Tibone JE, Chandler RW. Repair of distal biceps tendon ruptures in athletes. Am J Sports Med. 1993 Jan-Feb. 21 (1):114-9. [Medline]. Gaskin CM, Anderson MW, Choudhri A, Diduch DR. Focal partial tears of the long head of the biceps brachii tendon at the entrance to the bicipital groove: MR imaging findings, surgical correlation, and clinical significance. Skeletal Radiol. 2009 Oct. 38 (10):959-65. [Medline]. Tangari M, Carbone S, Gallo M, Campi A. Long head of the biceps tendon rupture in professional wrestlers: treatment with a mini-open tenodesis. J Shoulder Elbow Surg. 2011 Apr. 20 (3):409-13. [Medline]. Boyd HB, Anderson LD. A method for reinsertion of the distal biceps brachii tendon. J Bone Joint Surg. 1961. 43:1041-3. Schneider A, Bennett JM, O'Connor DP, Mehlhoff T, Bennett JB. Bilateral ruptures of the distal biceps brachii tendon. J Shoulder Elbow Surg. 2009 Sep-Oct. 18 (5):804-7. [Medline]. Morrey BF, Askew LJ, An KN, Dobyns JH. Rupture of the distal tendon of the biceps brachii. A biomechanical study. J Bone Joint Surg Am. 1985 Mar. 67 (3):418-21. [Medline]. Sutton KM, Dodds SD, Ahmad CS, Sethi PM. Surgical treatment of distal biceps rupture. J Am Acad Orthop Surg. 2010 Mar. 18 (3):139-48. [Medline]. Hughes JS, Morrey BF. 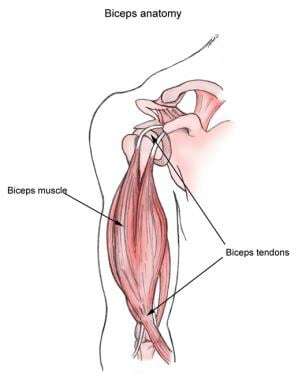 Injury of the flexors of the elbow: biceps tendon injury. Morrey BF, Sanchez-Sotelo J, eds. The Elbow and its Disorders. 4th ed. Philadelphia: Saunders Elsevier; 2009. 518-35. Mazzocca AD, Burton KJ, Romeo AA, Santangelo S, Adams DA, Arciero RA. Biomechanical evaluation of 4 techniques of distal biceps brachii tendon repair. Am J Sports Med. 2007 Feb. 35(2):252-8. [Medline]. Fenton P, Qureshi F, Ali A, Potter D. Distal biceps tendon rupture: a new repair technique in 14 patients using the biotenodesis screw. Am J Sports Med. 2009 Oct. 37(10):2009-15. [Medline]. Citak M, Backhaus M, Seybold D, Suero EM, Schildhauer TA, Roetman B. Surgical repair of the distal biceps brachii tendon: a comparative study of three surgical fixation techniques. Knee Surg Sports Traumatol Arthrosc. 2011 Nov. 19(11):1936-41. [Medline]. Peeters T, Ching-Soon NG, Jansen N, Sneyers C, Declercq G, Verstreken F. Functional outcome after repair of distal biceps tendon ruptures using the endobutton technique. J Shoulder Elbow Surg. 2009 Mar-Apr. 18(2):283-7. [Medline]. Snir N, Hamula M, Wolfson T, Meislin R, Strauss EJ, Jazrawi LM. Clinical outcomes after chronic distal biceps reconstruction with allografts. Am J Sports Med. 2013 Oct. 41(10):2288-95. [Medline]. Freeman CR, McCormick KR, Mahoney D, Baratz M, Lubahn JD. Nonoperative treatment of distal biceps tendon ruptures compared with a historical control group. J Bone Joint Surg Am. 2009 Oct. 91(10):2329-34. [Medline]. Nesterenko S, Domire ZJ, Morrey BF, Sanchez-Sotelo J. Elbow strength and endurance in patients with a ruptured distal biceps tendon. J Shoulder Elbow Surg. 2010 Mar. 19 (2):184-9. [Medline]. Cil A, Merten S, Steinmann SP. Immediate active range of motion after modified 2-incision repair in acute distal biceps tendon rupture. Am J Sports Med. 2009 Jan. 37(1):130-5. [Medline]. Chen HS, Lin SH, Hsu YH, Chen SC, Kang JH. A comparison of physical examinations with musculoskeletal ultrasound in the diagnosis of biceps long head tendinitis. Ultrasound Med Biol. 2011 Sep. 37(9):1392-8. [Medline]. Fitzpatrick D, Menashe L. Magnetic Resonance Imaging Evaluation of the Distal Biceps Tendon. Am J Orthop (Belle Mead NJ). 2018 May. 47 (5):[Medline]. [Full Text]. de la Fuente J, Blasi M, Martínez S, Barceló P, Cachán C, Miguel M, et al. Ultrasound classification of traumatic distal biceps brachii tendon injuries. Skeletal Radiol. 2018 Apr. 47 (4):519-532. [Medline]. [Full Text]. Bauer TM, Wong JC, Lazarus MD. Is nonoperative management of partial distal biceps tears really successful?. J Shoulder Elbow Surg. 2018 Apr. 27 (4):720-725. [Medline]. Checo FJ, Rodner CM. Bone tunnel and suture anchor fixation of distal biceps tendon ruptures. Sports Med Arthrosc. 2008 Sep. 16(3):124-9. [Medline]. Papp DF, Skelley NW, Sutter EG, Ji JH, Wierks CH, Belkoff SM, et al. Biomechanical evaluation of open suture anchor fixation versus interference screw for biceps tenodesis. Orthopedics. 2011 Jul 7. 34(7):e275-8. [Medline]. Cohen MS. Complications of distal biceps tendon repairs. Sports Med Arthrosc. 2008 Sep. 16(3):148-53. [Medline]. Grewal R, Athwal GS, Macdermid JC, Faber KJ, Drosdowech DS, El-Hawary R, et al. Single versus double-incision technique for the repair of acute distal biceps tendon ruptures: a randomized clinical trial. J Bone Joint Surg Am. 2012 Jul 3. 94(13):1166-74. [Medline]. Nigro PT, Cain R, Mighell MA. Prognosis for recovery of posterior interosseous nerve palsy after distal biceps repair. J Shoulder Elbow Surg. 2013 Jan. 22(1):70-3. [Medline]. Lintner S, Fischer T. Repair of the distal biceps tendon using suture anchors and an anterior approach. Clin Orthop Relat Res. 1996 Jan. 116-9. [Medline]. Bain GI, Prem H, Heptinstall RJ, Verhellen R, Paix D. Repair of distal biceps tendon rupture: a new technique using the Endobutton. J Shoulder Elbow Surg. 2000 Mar-Apr. 9(2):120-6. [Medline]. Lo EY, Li CS, Van den Bogaerde JM. The effect of drill trajectory on proximity to the posterior interosseous nerve during cortical button distal biceps repair. Arthroscopy. 2011 Aug. 27(8):1048-54. [Medline]. Caputo AE, Cusano A, Stannard J, Hamer MJ. Distal biceps repair using the lacertus fibrosus as a local graft. J Shoulder Elbow Surg. 2016 Jul. 25 (7):1189-94. [Medline]. Khalil LS, Keller RA, Mehran N, Marshall NE, Okoroha K, Frisch NB, et al. The utility of botulinum toxin A in the repair of distal biceps tendon ruptures. Musculoskelet Surg. 2018 Aug. 102 (2):159-163. [Medline]. Garon MT, Greenberg JA. Complications of Distal Biceps Repair. Orthop Clin North Am. 2016 Apr. 47 (2):435-44. [Medline]. Hasan SA, Cordell CL, Rauls RB, Bailey MS, Sahu D, Suva LJ. Two-incision versus one-incision repair for distal biceps tendon rupture: a cadaveric study. J Shoulder Elbow Surg. 2012 Jul. 21(7):935-41. [Medline]. Schmidt CC, Diaz VA, Weir DM, Latona CR, Miller MC. Repaired distal biceps magnetic resonance imaging anatomy compared with outcome. J Shoulder Elbow Surg. 2012 Dec. 21(12):1623-31. [Medline]. Potapov A, Laflamme YG, Gagnon S, Canet F, Rouleau DM. Progressive osteolysis of the radius after distal biceps tendon repair with the bioabsorbable screw. J Shoulder Elbow Surg. 2011 Jul. 20(5):819-26. [Medline]. Banerjee M, Shafizadeh S, Bouillon B, Tjardes T, Wafaisade A, Balke M. High complication rate following distal biceps refixation with cortical button. Arch Orthop Trauma Surg. 2013 Oct. 133(10):1361-6. [Medline].